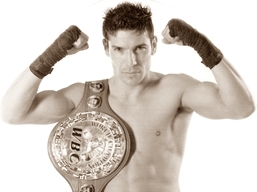 On April 17, Sergio scored an impressive upset victory over Kelly Pavlik to win the WBC / WBO Middleweight Championship. Then on November 20, he avenged a previous loss to Paul Williams with a spectacular second round knockout to retain his middleweight belts. This was 12 rounds of toe-to-toe non-stop action and a fight fans dream fight. Soto retained his WBC Lightweight Championship by a close, unanimous decision in this fight for the ages. This fight started off with Khan registering a first round knockdown over Maidana. With Khan ahead on all scorecards going into the 10th round, a desperate Maidana landed a huge right hand to Khan’s jaw. THis buckled Khan’s legs and it appeared he would be knocked out. A vicious right hand followed by a left literally had Khan out on his feet. He weathered the storm to retain his WBA Junior Welterweight title with a unanimous, but close, 12 round decision. … and for those who may not have an image based browser, or just love it in plain text. Here is the whole breakdown with a bit more detail. Tunney announced his retirement from professional boxing on July 31, 1928, relinquishing the championship. Schmeling defeated Jack Sharkey to earn universal recognition as champion but was stripped of the NYSAC version of the title in 1931 for refusing a rematch with Sharkey. The NYSAC title remained vacant until the two men eventually did fight in 1932. In late 1934 the International Boxing Union ordered world champion Max Baer to defend his title against the reigning European champion, Pierre Charles of Belgium. 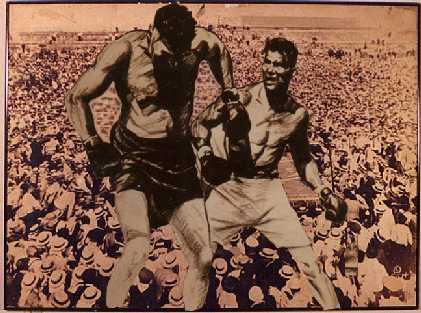 When Baer instead opted to fight James J. Braddock they withdrew recognition of him as champion. The IBU matched Charles with the American heavyweight George Godfrey for their version of the title with the fight taking place in Brussels, Belgium on 2 October 1935. Godfrey won a fifteen round points decision but did not press any claim to the championship and was inactive for the next two years. The IBU then recognized Baer’s successor, James J. Braddock, as champion. Charles won the vacant National Boxing Association championship in June 1949, but was not universally recognized as champion until June 1951. On the retirement of Joe Louis in March 1949, the European Boxing Union announced that a fight in May 1949 between Lee Savold of the USA and British champion Bruce Woodcock would determine their version of the world heavyweight title. The NYSAC and the British Boxing Board of Control (BBBofC) also decided to recognize the winner of the fight as their champion but it was postponed for over a year due to injuries Woodcock had suffered in a car crash. The NYSAC decided instead to recognize the winner of the upcoming bout in September 1950 between Ezzard Charles and Joe Louis as their champion. Louis was returning to the ring after an absence of 27 months. When the fight for the EBU and BBBofC world heavyweight titles eventually took place in June 1950, Savold defeated Woodcock in four rounds. Following his defeat to Joe Louis in a non-title fight in June 1951, Lee Savold was no longer recognized as the world heavyweight champion by the EBU and the BBBofC, who both immediately transferred their recognition to Ezzard Charles. Charles therefore became universally recognized as world heavyweight champion. Marciano announced his retirement from professional boxing, relinquishing the championship. The WBA, the NYSAC and several other US state boxing commissions withdrew recognition of Ali as champion for his refusal to be inducted into the United States Army subsequent to being drafted in early 1967. The WBC eventually followed the lead of the WBA and the NYSAC and stripped Ali of their title in March 1969. Frazier and Ellis fought on February 16, 1970, at Madison Square Garden, New York. Frazier entered the ring as the holder of NYSAC version of the world title and Ellis held the WBA heavyweight title. The fight was also for the WBC title vacated by Muhammad Ali. Frazier defeated Ellis and was universally recognized as champion. He cemented his reputation upon defeating Muhammad Ali on March 8, 1971. Spinks was stripped of his world title by the WBC for refusing to defend his title against their #1 ranked contender, Ken Norton. Spinks instead agreed to fight a return bout against Ali for the WBA crown. The WBC awarded Norton the title and, since he lost to Larry Holmes in his next defense, he is sometimes omitted from a list of heavyweight champions because he never won a world title fight. Holmes relinquished his WBC title to assume the championship of the newly formed International Boxing Federation. Believing his career over, Ali relinquished his WBA title in exchange for a payment from promoter Don King, who was trying to stage a bout between then-WBC champ Larry Holmes and John Tate for the undisputed title. The bout never materialized, and Ali would return to the ring in 1980. Jamaican born Berbick was a naturalized Canadian citizen and former Canadian heavyweight champion. Bowe was stripped of his WBC championship for refusing to fight Lennox Lewis. Lewis was born in England but moved to Ontario, Canada at the age of 12, later winning an Olympic gold medal for Canada. Lewis defeated Razor Ruddock on October 31, 1992, in a WBC ‘eliminator’ fight. When Riddick Bowe‘s championship recognition was withdrawn by the organization, the WBC immediately awarded Lewis the title. The World Boxing Association withdrew its recognition of Foreman, but Foreman retained IBF championship recognition until it too was withdrawn. The IBF withdrew its recognition of Foreman when he declined a rematch with Axel Schulz of Germany. Schultz was matched with Francois Botha of South Africa for the vacant title. The bout took place on December 9, 1995 in Stuttgart and resulted in a split decision points victory for Botha. Botha however tested positive for illegal anabolic steroids in a post-fight drugs test and the result was changed to a no-contest. Although some record books continue to list Botha as a world champion, the IBF state that they do not regard that he was ever champion. Akinwande had been ranked the WBC’s #2 contender when he won the WBO title. The WBC, which has feuded with the WBO since the latter’s founding in 1988, dropped Akinwande from its rankings altogether. Akinwande subsequently relinquished his WBO title in exchange for the opportunity to meet Lennox Lewis in a bout for the WBC championship. In early 2000 the World Boxing Association and Lewis were sued by representatives of John Ruiz claiming that they had reneged on an agreement by which Ruiz would have fought Lewis for the WBA title. A New Jersey court ruled in favor of Ruiz, and ordered Lewis to either have his next bout against Ruiz or relinquish the title. Lewis elected instead to fight contender Michael Grant, relinquishing his WBA title on the day of the match. Lewis relinquished the IBF title upon receiving payment of $1 million (US) by promoter Don King, who wished to stage a bout between Chris Byrd and Evander Holyfield for the vacant title. Ruiz beat Hasim Rahman on December 13, 2003, to become the WBA’s “interim” champion. He was awarded the championship following Roy Jones, Jr.’s announcement that he was relinquishing it to concentrate on lower weight divisions. Ruiz’s title reign ended on April 30, 2005, following a loss to James Toney but ten days later, a drug test on Toney detected he had used products containing nandrolone, an anabolic steroid. Thus, Toney’s victory was changed to a ‘no contest’ by New York state athletic commission, and as a result, the WBA declared Ruiz was keeping the title. Rahman defeated Monte Barrett on August 13, 2005, to become the WBC’s “interim” champion. He was awarded the championship following Vitali Klitschko‘s announcement that he was retiring due to injury. Maskaev was born in Kazakhstan to Russian parents. He originally held Kazakh citizenship but was granted US citizenship in 2004. In December 2006 he was also granted Russian citizenship. On September 24, 2007, Samuel Peter was declared the WBC’s “interim” champion. Peter ultimately defeated Maskaev on March 8, 2008. Chagaev’s mandatory title defence against former champion Nikolay Valuev, scheduled for July 5, 2008, had to be cancelled for a second time after Chagaev suffered a complete tear of an Achilles tendon during his training for the fight. Because of the injury and necessary recovery time, the WBA elected to make Chagaev “Champion In Recess” and mandated that top-contenders Valuev and John Ruiz meet for the title. They set a deadline of June 26, 2009 for Chagaev to fight the champion but as this deadline was not met, Chagaev was stripped of his “Champion In Recess” title when the WBA published their Official Ratings as of June 2009. The WBA had set a deadline of June 26, 2009 for Chagaev to fight the champion but this deadline was not met. On July 24, 2009, when the WBA published their Official Ratings as of June 2009, Chagaev was stripped of his “Champion In Recess” title. Valuev regained the WBA title by beating John Ruiz on August 30, 2008, shortly after Chagaev had become the “Champion In Recess”. Upon making Chagaev the “Champion In Recess”, the WBA set a deadline of June 26, 2009 for him to fight the champion. This deadline was not met and Chagaev was stripped of his “Champion In Recess” title when the WBA published their Official Ratings as of June 2009. In 2010 Haye was awarded citizenship of North Cyprus . A state whose existence is recognized only by Turkey. There is no doubt the heavyweights will always be the ‘Kings of the Ring’ and be the big names. The last hundred years or so of heavyweight history have been an amazing thing to watch, read and be a a part of. I don’t know about you, but I cant what to see what and who comes next. I have followed boxing now for about half a century and I truly consider myself blessed meeting so many wonderful people in that tenure. The past twenty-five years I have also been blessed being involved in working with amateur fighters in local boxing gyms in which I have met many kids that have delighted in my teaching and expertise. In August of this year, I, along with Henry Calles, a former amateur fighter and owner of Duke’s Boxing in Isla Vista, California, took one of our young fighters to a show in Lompoc, California. These shows are a showcase for all amateur boxers, male and female, and are simply a treat for boxing fans to come out and support their fighters. 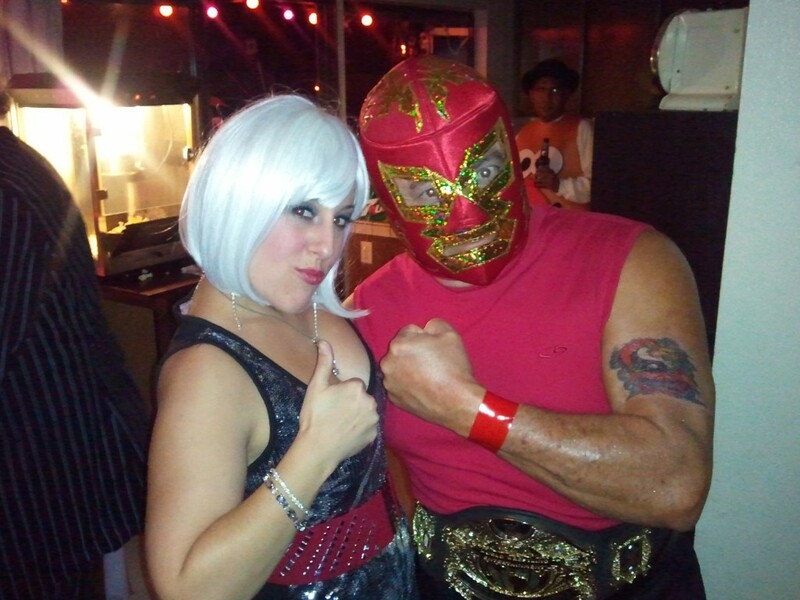 Once at the Lompoc arena, we were preparing our male fighter for his fight. Off in the distance, I couldn’t help but notice a young girl warming up with her trainer prior to her fight. I must admit that I was distracted because of the excellent shadow boxing and mitt work that I observed. I knew right then and there that this girl was special, and so I anxiously waited to see her fight in the ring. When her bout came, I sat close to ringside and I was very impressed to see this young female boxer do her work in such an amazing style; a beautifully executed left jab and complete focus in the ring. After winning a three round bout by decision, I knew that I wanted to do a feature story for my website to showcase her and what she represents in female amateur boxing. Her sportsmanship and ring generalship is what really impressed me the most. 1) Sugar Ray Robinson suffered his first defeat of his career to Jake LaMotta on February 5, 1943 … the rematch for that fight would take place how many days later in same month ? 2) What Gold Medal winner was voted the most outstanding boxer in the 1976 Olympics ? We finally have a fight at the Superdome in Dallas, and it’s not the Cowboys or their cheerleaders who are involved. The Dallas Cowboys are an embarrassment as a team. Except for their cheerleaders and a lap dance or two, they offer nothing of interest for the fans. With that in mind, there is the possibility of a good fight taking place in this venue on November 13. Manny Pacquiao is a solid fighter, and if Mayweather would be willing to put his undefeated tag on the line, you’d have a great fight with a great crowd. Using the Cowboys cheerleaders as ring girls seems like an extra incentive for a fight that probably doesn’t need the push. So, let’s get to the fight in question, Manny “Pac Man” Pacquiao against Tony “I plead innocent” Margarito. Seriously, this could be a very interesting fight. The question that has to be asked is if Margarito has a solid punch with the loss of the “heavy” material in the gloves, why didn’t he show that power against Shane Mosley last year. Another question that must be answered is if Pac Man, who trainer Freddy Roach said “had the worst training camp he had ever had.” Manny, not training hard, raises many other questions; mainly, is he taking Margarito too lightly. First, let’s take a look at the match-up itself: At 32, Margarito is a year older than the southpaw Pacquiao. Okay Rusty, the election is over and the votes are in; it’s time to “man-up”! Bet you’re thinking about the local and national elections, but in truth I’m talking about the election for the newest class for the International Boxing Hall of Fame in Canastota. The ballots had to be in by November 1, and in the interest of being true to my word (in boxing)? I could not vote for Mike Tyson. As I wrote in this column a few weeks back, I cannot and will not, vote for anyone who has used performance enhancing drugs, unless that person goes into the Hall with an asterisk after his/her name. It’s not that Tyson needs my vote. He’s a lock for the Hall on the first ballot, and deservedly so. Tyson won a lot of his fights on the fear of his ring foes, but he still deserves admittance to the IBHOF. But he should have the fact that he used these banned drugs registered on his record. Until the Hall of Fame does so, either via asterisk or other means, I’ll continue to vote for anyone proven to have used these substances. In my mind, or what’s left of it, I have to believe that these PED drugs not only assist in the performance of the fighter, but also fool the fight fans as well. For the record, I voted for Julio Cesar Chavez, and five others, who, to the best of our knowledge fought ‘clean’. Sad to note the passing of Alan Rudkin, British bantamweight champ, who left us at age 68. 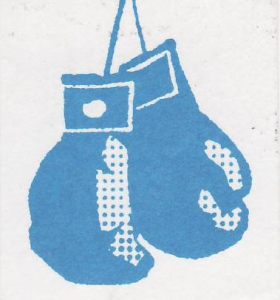 Also news that Johnny ‘Smiler’ Van Rensburg, 78, South African light and welterweight champion. Prayers are requested.